Likud says Jerusalem stabbing occurred after Livni said she's willing to split Jerusalem. 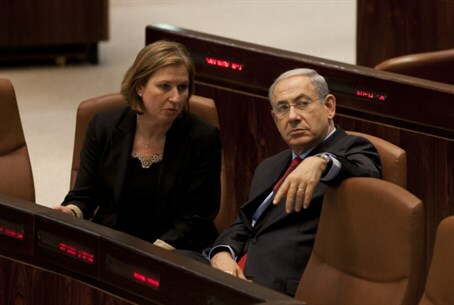 Livni: Netanyahu has no limits. Prime Minister Binyamin Netanyahu and MK Tzipi Livni, one of the leaders of the joint Labor-Hatnua list known as “the Zionist Camp”, traded barbs on Sunday evening following a stabbing terrorist attack in Jerusalem. “If Tzipi and Buji [Herzog] will head a leftist government, Hamas will be in the heart of Jerusalem,” the statement went on to warn. Hours later, an outraged Livni responded to the Likud’s statement during a meeting with potential voters in the Sharon region of Israel, accusing Netanyahu of “dancing on the blood” of the victim of the terrorist attack. "Does the Prime Minister not have any limits? Someone to tell him, ‘Stop, an Israeli citizen was hurt here, you cannot be dancing on the blood of others, you cannot cynically take advantage of each incident of terrorism to translate it to votes'? And then I thought to myself: He knows no limits because that's what he's been doing all these years,” charged Livni. "I have to count to ten before I start to speak here," she continued, denying she agreed to split Jerusalem. "We heard about a stabbing attack in Jerusalem, but when I got into my car, I saw the statement of the Likud. I do not know if you saw this thing...First of all, the facts - that's not true. It's another kind of hysterical lie. I guess that Netanyahu is sensing his loss in the elections." Later on Sunday night, the “Zionist Camp” issued a statement attacking the Likud over its linking Livni with the attack. Netanyahu has been directly attacking Livni in recent days, and last week warned that Labor is trying to "hide" Livni from the public - and for good reason. "Tzipi Livni is a danger to the state," he said about the woman whom he selected as Justice Minister and chief "peace negotiator" in his previous government. The Likud has also released a humorous video, showing a customer ordering a pizza from “Pizza Buji” - a play on Herzog’s nickname - only to be stuck with a cardboard cutout of Livni.